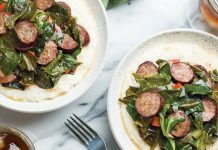 As Louisiana’s most intriguing culinary achievement, gumbo is a metaphor for the combination of cultures that gave rise to this amazing melting-pot soup. There are as many different kinds of gumbos as there are cooks, ranging from gluten-free to seafood or wild game. 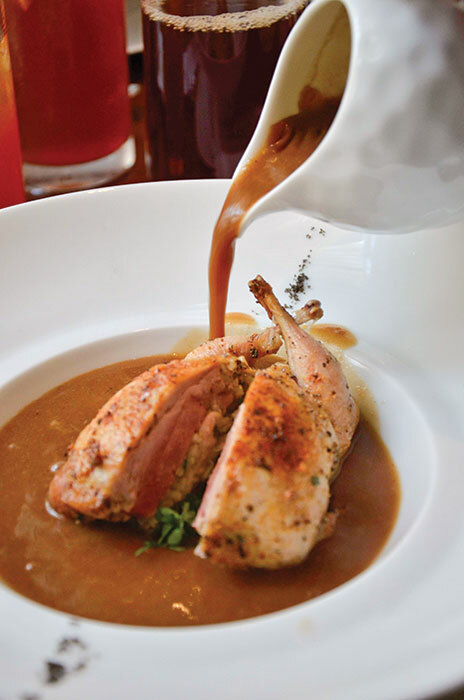 We begin our gumbo tour in the heart of New Orleans’s French Quarter, where the gumbo guru, Chef John Folse, serves his incomparable quail gumbo at Restaurant R’evolution in the Royal Sonesta Hotel. The brainchild of two world-famous superstar chefs, John and Chicago’s renowned Rick Tramonto, the elegant 6,000-square-foot showplace opened in 2012. John, who is regarded as Louisiana’s leading authority on Cajun and Creole cuisine, created the sumptuous Death by Gumbo in the 1980s and reintroduced it at R’evolution. Heading to Metairie, we stop in at Chef Ron’s Gumbo Stop and Pub that opened in 2012. 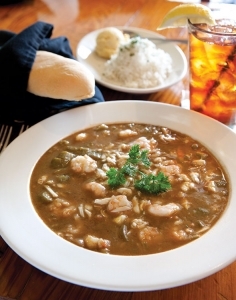 It showcases a rare item in Louisiana: gluten-free gumbo, as well as gluten-free crawfish étouffée. A native of New England, Chef Ron Iafrate first learned about the art of Louisiana cooking in Acadia, Rhode Island, at a festival with zydeco legend Queen Ida as the headliner. He uses rice flour to make a roux, and gets gluten-free sausages from Mississippi. In a quiet section of Metairie is another Ralph Brennan hit. Chef Chris Montero, who heads up café b, is a veteran of the Brennan restaurant empire. The upscale neighborhood bistro has a large, snazzy bar in the front that is popular among well-heeled locals who stop in for drinks and appetizers after work. 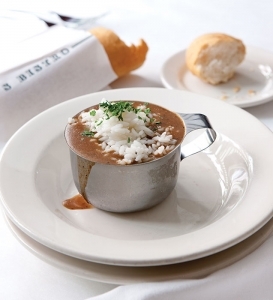 This is restyled comfort food at its best, highlighted by some of the most delicious gumbo in town. 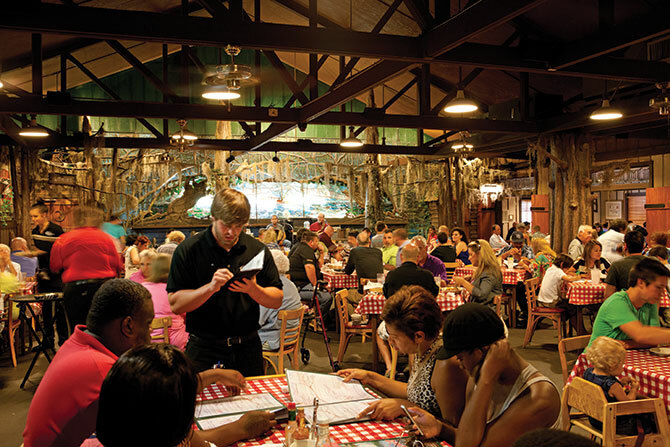 We nibble on barbecue oysters dripping with blue cheese and airy crab beignets with a creamy ravigote sauce before delving into the superb Chicken and Andouille Gumbo, served with a scoop of green onion potato salad on the side. 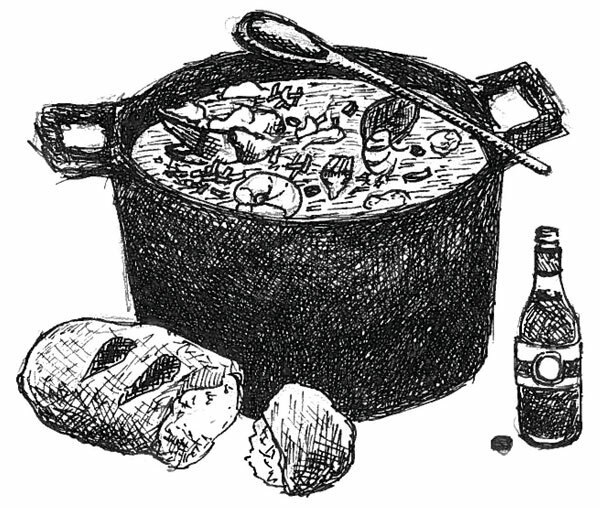 Cynthia’s delicious seafood gumbo is only rivaled by her toothsome Hen and Andouille Gumbo. “A hen holds up better than a young fryer, and I like the flavor better,” she notes. The Schneiders get their andouille from Poché’s, a top smoked-meat market in Breaux Bridge, Louisiana. Nestled along the expanse of the Atchafalaya Basin in Henderson is Robin’s, where some of the best Crabmeat Gumbo in south Louisiana can be found. 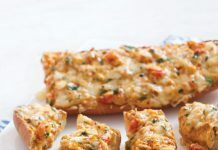 The flavors are rich and complex, and the fat, buttery lumps of crabmeat are generously apportioned. Here is the best part: “I make it to order, whatever you want, whenever you come in,” says Chef-Owner Lionel Robin. He means it. The crawfish gumbo and shrimp and okra gumbo are utterly fresh and perfectly spiced. The chef likes to come out and talk to diners. Try one of his homemade ice creams for dessert (hint: Tabasco). The next stop is New Iberia and Jefferson Island. 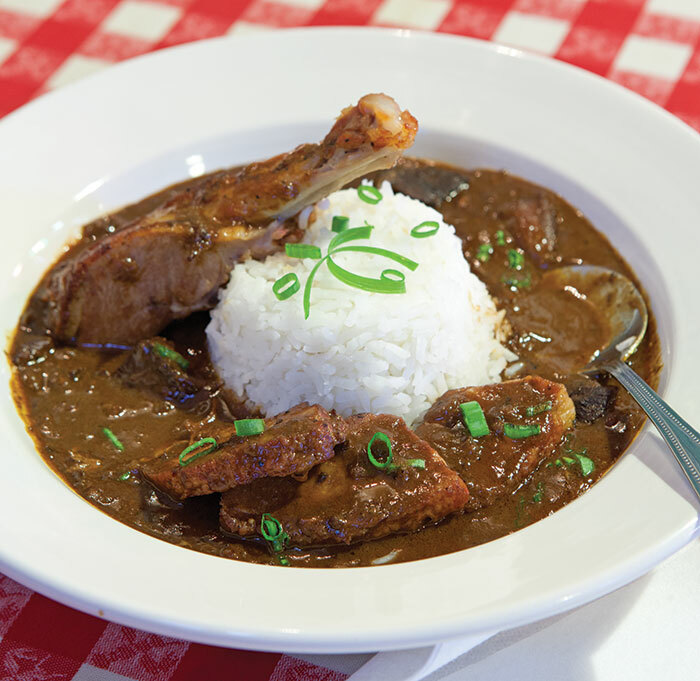 Not to be missed is the earthy, rich Chicken, Smoked Sausage, and Tasso Gumbo served at the charming Café Jefferson. 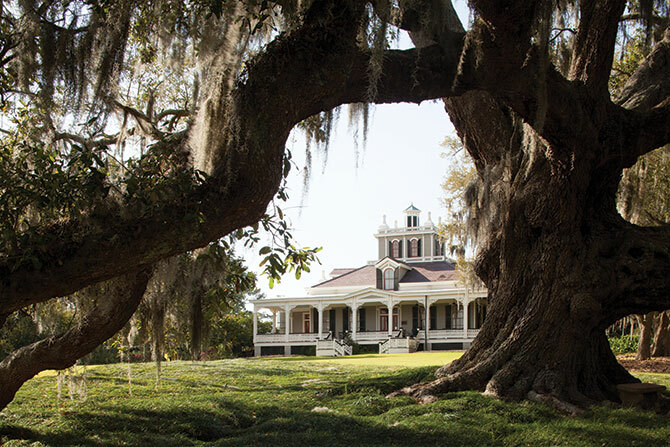 Nestled in gorgeous Rip Van Winkle Gardens, the café is only open for lunch and offers a splendid view of Lake Peigneur from picture windows surrounded by ancient live oaks dripping with Spanish moss. Take a stroll around the magnificent grounds after lunch. In nearby Lafayette, we start lacing up our dancing shoes and loosening our belts in anticipation of the thumping live Cajun music and the outstanding gumbo at Prejean’s, a popular Cajun restaurant and dance hall that is famed for its luscious Pheasant, Quail, and Andouille Gumbo served exclusively at the New Orleans Jazz and Heritage Festival for the past 17 years. In north Louisiana, downtown Monroe has a rising star chef who makes the drive worth your while. The award-winning Chef Cory Bahr dazzles diners with his ingenious southern cuisine at Restaurant Cotton. Cory’s gumbos begin with a half-oil, half-butter “fast” roux. “We get the oil and butter to where it’s smoking, whisking it quickly on high heat, then we start adding the flour until we get a really dark roux. It only takes 15 minutes, and the roux looks like a chocolate bar,” he says. 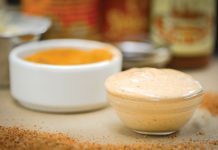 “We caramelize the onions in the roux until they’re golden, add the tasso, and then we gradually add the stock into the roux, simmering it for two hours so that flour taste is all cooked out. We adjust the seasoning, and at that point, we’ll turn off the fire and fold in the meat and let it sit on the stove for about another 45 minutes.” Cory also makes a mean Smoked Ham Hock and Black-Eyed Pea Gumbo, which he finishes with a drizzle of collard green pesto, adding garlic and Tabasco to give it even more authentic flavor. How can you leave Dooky Chase and Dunbars in New Orleans off your list ? Thanks for commenting! 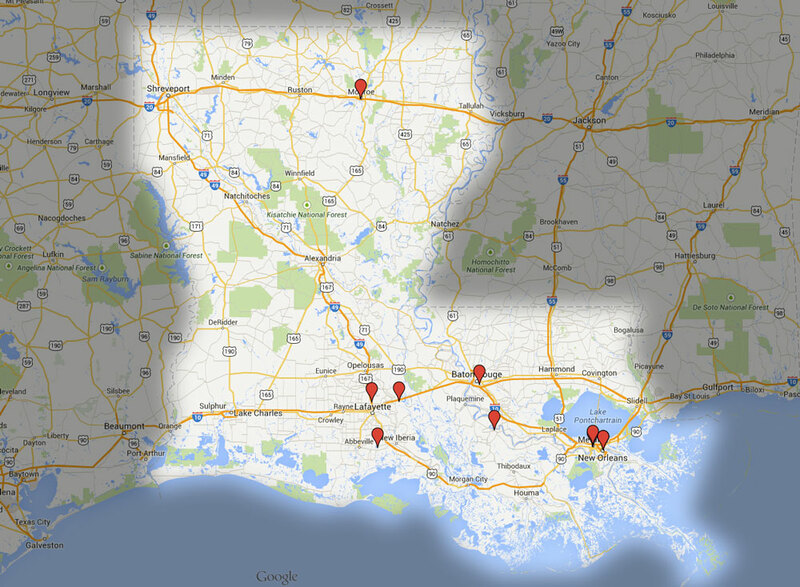 There are lots of gumbos we love that couldn’t make the list, as we try to cover as much of Louisiana as we can. You can be sure, though, that you’ll see them on future lists. I just have to admit. At the Jazz festival last year. I had some of Prejeans Quail, Pheasant and Andouille sausage gumbo. That was the best gumbo I’ve ever eaten and I’m from Louisiana. I’m returning again this year only for that.